Recently, I was looking for a way to help one of my favorite all-volunteer nonprofits right in my hometown. I joined a committee but found it challenging to make meetings or take on jobs at the organization's site. So I jumped at the chance to do something from home, on my computer. Since I work from home and pretty much spend my life at the keyboard, it was a no-brainer to offer to be the point person for reservations for a series of special events. I accept email reservations for a variety of dates, enter them into Excel, and email acknowledgments and reminders. The job fits perfectly into my breaks throughout the day. What a deal! Volunteering has changed dramatically over recent years. From serving in soup kitchens, signing up for school functions, to building houses, usually volunteering meant going somewhere to do something. However, today’s volunteering includes donating your virtual time and skills. Instead of being present to volunteer in the “real world,” many people have found their place in the world of virtual volunteering. Virtual volunteering allows you to commit your time and services away from the physical site of an organization, project, or campaign. 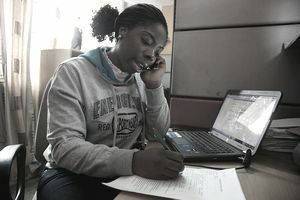 Virtual volunteers work over the internet via computer, tablet or phone to provide their skilled services to support a cause that is important to them. Of course, this is just a small sample of all the possible virtual volunteering tasks a person could provide. Each organization has a different approach, so there will be unique ways for volunteers to support each charity remotely. Moreover, while physical volunteers are in just as much in demand as virtual ones, the shift towards the Internet has made these volunteer positions plentiful. Since the 1990s, when the internet became publicly available, the definition of volunteerism has evolved. The term “virtual volunteer” was first referenced in 1995 by Steve Glikbarg, co-founder of Impact Online. It became a way to distinguish the new work volunteers were doing outside of traditional volunteering roles. Glikbarg’s company later became VolunteerMatch, one of the biggest online databases that match volunteers to organizations. Almost all nonprofits have made a home online, connecting people with their causes and programs all over the world. Now, finding a volunteer opportunity is just like finding a paid job; most people go online to search and apply. While virtual volunteering is as old as the internet, it has become an ever-more familiar part of our world as ways of collaborating online have become more sophisticated. Now, we can be alerted to virtual volunteer opportunities instantaneously, and we can work with other people through chats and virtual meeting spaces. Moreover, training for volunteer work can be delivered efficiently right online. There’s no denying that we have become an increasingly digital culture and, in many ways, that is not a bad thing. The internet has allowed us to do so much more in much less time, and our skills are no longer limited to our geographical location. More skill sets have stemmed from society's use of technology, as well. Because of that, volunteering is no longer limited to just physical labor or attendance. Organizations need websites as well as “boots on the ground.” They need help with their social media and assistance in the community. One exciting new frontier has been the ability to crowdsource data for research in the humanities and sciences. For instance, history buffs can collaborate with the Smithsonian to help make historical documents accessible. Birdwatchers can help track bird populations and migration patterns with eBird. And amateur astronomers can contribute to mapping the skies at Zooniverse. For those people who long to volunteer for global causes but the PeaceCorps seems unrealistic, the United Nations has the answer. UN Volunteers online offers safe opportunities to do good around the world in a vast variety of ways from translation to outreach and advocacy. Many of these crowdsourcing opportunities fall into the unique category of micro-volunteering because one can perform them in just snippets of time and the tasks may not require formal training or qualification. Looking for more ways to use your smartphone? Try micro-volunteering. Today, nonprofit organizations need more help than ever to support their everyday operations and to expand. Virtual volunteering has helped many nonprofits to grow and broaden their impact. It is easy to see the allure of virtual volunteering for volunteers. Ask any volunteer about the obstacles that made service difficult and they are likely to say, “Making time to get there.” Between work, family time, commuting, and the general chaos of daily life, virtual volunteering could be the solution that many volunteers and organizations need. While there are countless benefits to volunteering, for both the individual and the causes they support, virtual volunteering has opened up a whole new realm of possibility. Jayne Cravens, the author of The Last Virtual Volunteering Guidebook, has studied the benefits of virtual volunteering for many years. Much of her research has highlighted both the personal and institutional benefits of this form of volunteerism. Of course, the benefits of volunteering, both physically and virtually, are unique to the person and organization. However, the upsides to virtual volunteering are entirely different from the benefits of traditional volunteering. We have never before had the opportunities we have today. These new possibilities make it easier for nonprofits to function in the current digital society with more volunteers. They also make it easier for people to support causes from anywhere at any time. Most nonprofits are always looking for more volunteers. Finding the best virtual volunteer position for you is just a matter of knowing where to look. However, before you begin, it always helps to know what cause or program you want to support. Whether you like animals or want to help support kids in different countries, you need to narrow your area of focus. Then, you will need to figure out what type of virtual service you would like to provide. For instance, it could be social media management, copywriting, or even phone outreach. Use databases to get connected to potential openings and find legitimate organizations. Also, check out this great list from Coyote Communications to find virtual positions for causes you are passionate about. If there’s a particular organization you want to work for, you can also check the organization’s website for a volunteer section. This should have a list of volunteer opportunities specific to your chosen organization or program. Before you sign up for an online volunteer position, make sure that the organization does the kind of work that you support and that fits your interests and skills. Online volunteerism is entirely different from “in-person” volunteering in a few distinct ways. Because the dynamic is different, there are a few things you should always do before signing up online. The first thing Jayne Cravens recommends is to look for organizations that are a “registered 501(c)(3) agency or part of a government agency.” However, that is not all. 1. Research each organization thoroughly. Start with organizations you have heard of, or where people you know have volunteered. For unknown programs, search for their website, social media, and volunteer openings. Moreover, as Jayne Cravens mentioned, check for their 501(c)(3) status. 2. Eliminate fraudulent or unstable organizations. Check out the consumer reports of the nonprofit world. They include Charity Navigator, the Better Business Bureau, the American Philanthropy Institute and GuideStar. Many volunteers use Indeed.com, Great Nonprofits, or Glassdoor.com to get a feel for employee and volunteer reviews of an organization. 4. Know what kind of training or experience is required. Some organizations need high-level experts while other positions are entry level. Searching for the necessary degree of expertise (and the needed commitment) can help whittle down your selection. 5. Discuss needs and expectations. Sometimes, remote volunteer communication can be hard. Make sure to discuss hours, which tasks are your responsibility, and how to contact people when you need help. Deadlines and important dates are also important if your volunteer work is not ongoing. These steps will help you find the perfect virtual volunteer opportunity. They will also make your experience much more pleasant. Volunteering is an age-old institution. From school fundraising, church programs, and corporate philanthropy, it is a part of nearly every area of our lives. "Traditional” volunteering will always be around, but virtual volunteering has changed the way many of us give back. When you are ready to start volunteering (or volunteer more), this trend could open many doors you had not considered before. Virtual volunteering provides an outlet for many different skills and passions, but it also makes it easier for organizations to do good work all over the world. Become a part of the movement that is making a difference; become a virtual volunteer.